A win for Queenstown printer Martin Douglas in the 2015 Competenz Print Scholarship shows that trade skills and training in the Queenstown Lakes District are up there with the best in the country. Martin is embarking on his Level 5 National Diploma in Print Industry Management, a two-year programme of part-time training on-the-job that will add business management skills like job costing and quality management to the technical skills he has built up during his printing apprenticeship. “Further learning’s something that’s always appealed to me, and winning the scholarship to fund my Diploma study is a great opportunity to get back on the training horse,” says Martin. Martin pays tribute to his employers at Print Central, Graeme and Kerry Hastie, for the support they’re given him right through his training. Graeme speaks highly of Martin’s attitude and abilities. 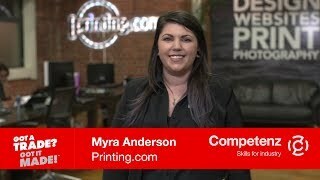 Print Central is investing heavily in building their team’s skills. One employee is currently working towards a printing apprenticeship and three (including Martin) are doing the print diploma through Competenz. Competenz is the industry training organisation for the printing, packaging and signmaking industries. The Competenz Print Scholarship encourages qualified printers to continue their training at Levels 5 with the National Diploma in Print Industry Management. The Scholarship covers the Competenz-related costs of the training (e.g. fees and learning resources). Please contact your Competenz account manager for more information or email us on marketing@competenz.org.nz.